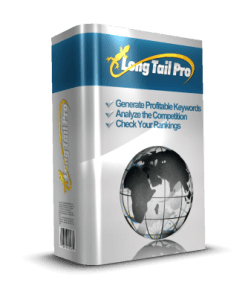 Long Tail Pro is an SEO keyword research tool, pulling through data out of the Google Keyword Planner and lists up related phrases with their monthly search volume, the average Adwords CPC (Cost Per Action) and advertiser competition analysis. Imports up to 10,000 keywords at once, where the user can analyse the relevancy, level of competition and search volume at a glance. Who Needs an SEO Keyword Research Tool? Anyone who is in the online business or uses online to expand the business needs it. Internet marketers, bloggers, e-commerce stores, affiliate marketers, advertisers, SEO and social media experts. Does Long Tail Pro (LTP) do its job? Is it the best keyword search tool? I have tried it and here’s what I’ve discovered. Long Tail Pro has been tested by 70,000+ marketers since the tool was first developed by Spencer Haws from NichePursuits.com in 2011. As the name suggests, LTP’s principle is attributable to the fact that “long tail keywords” make up over 70% of all search engine traffic. It also challenges the fact that 90% of SEO’s and marketers utilise at least 2 or more keyword tools when conducting keyword & competitor researches. Whilst other keyword tools only let you search one seed keyword at a time, LTP allows you to import more than 5 seed keywords simultaneously and produce 800 results per seed keyword. With so many suggestions, you don’t need another to waste your time by re-researching. That’s the idea. Installation of LTP is straight-forward. The software is an Adobe Air desktop based application, download a zip file containing the package containing an installation file and the PDF manual, I’m a Mac user, and the size of the application is 3.6Mb. Double-click the installation file and within seconds, the LTP app opens. 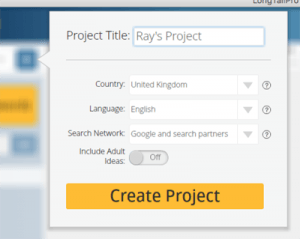 You start by creating a “project”, set your country, language and search network. Click “Create Project” and you’ll be prompted to sign in to your Google account. 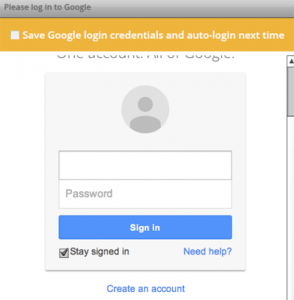 More specifically, you need to log in to your Google Adwords account and if you don’t have one, you need to sign up. When you first sign up with Google Adwords, you’ll be asked where the areas of your target visitors are. So this totally makes sense, so that LTP will bring out keywords information relevant to your site. Now it’s all good to go and you’ll be able to start searching for keywords. Long Tail Pro can filter only the keywords that have greater than, say, 1,500 exact match searches along with CPC (cost per click) of more than $1. These settings can be saved and reused. LTP also gives you a report about your sites ranking on search engines (Google, Bing and Yahoo) based on Incognito mode. It uses x-ray vision to reveal the site information of top competitors in Google, evaluating factors such as their headlines, meta tags, page ranking, the volume of backlinks, domain age etc. This function will allow you to compete against the top ten ranked sites. This feature is to make the keyword generation “better”. 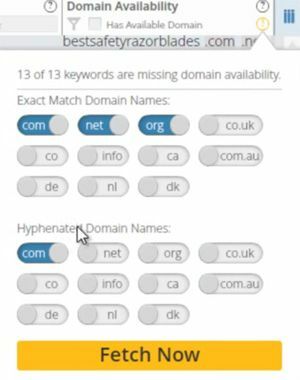 The additional data includes whether the domain (exact match domain as well as hyphenated domains) is available or not. Also conducts 1-click Competitor Analysis & Rank Checking directly from the same interface. It has an ability to export the data to a CSV file. All of these cannot be done with Google Keyword Planner or any free SEO keyword research tools. So this is definitely worth paying money for. The question is how much? You can start your 10-days trial for $1. Then it will be $37 per month. But if you pay annually after the trial period, there will be a 33% discount, $444 $297, which will work out as $25 per month. Now there’s something else for you to consider – the price includes free access to Long Tail University worth $197. Long Tail University is also run by the LTP creator, Spencer Haws, where he teaches in-depth strategies to find the most effective keywords to build powerful niche websites, as well as to build authority blogs and product businesses. Through the trainings you’ll gain knowledge and confidence in finding and analysing keywords, save time and ultimately, give higher profitability to your business by increasing traffic. Here is a quick summary of lessons you receive from Long Tail University. Lesson #1: Types Of Keyword – how to focus on the keywords and phrases that will lead to sales. Lesson #2: How To Find Seed Keyword – how to find different “pockets” in the market to help structuring websites and contents. 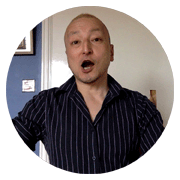 Lesson #3: How To Expand Seed Keyword – tapping into medium volume, low competition keywords that are highly relevant and targeting. Lesson #4: Criteria Of A Winning Keyword – breakdown of what criteria you should analyse, whether it’s worth pursuing or not. Lesson #5: How To Analyse Your Competition – training to be able to see how hard or easy to rank above competitors, what factors Google is looking at. Lesson #6: Competitors Keyword & SEM Rush – how to use SEM Rush to uncover profitable keywords, how you can ethically steal that traffic from your competitors. Lesson #7: Developing A Content Strategy – shortcuts for how you can create and optimise the content quickly & properly. Lesson #8: How To Write Great Content Based On Keyword – how to strategically place keywords throughout your content for search engines. Lesson #9: WordPress Settings & On-Page SEO – which plugins and tweaks to install on WordPress to maximise optimisation. Also to learn to receive organic traffic in 24 hours. Lesson #10: Keyword Tracking and ROI – how to utilise Google Analytics to track your return on investment. Webinar #1: Using keyword modifiers to take your research to the next level. It is said that this hour-long webinar alone is worth the value of the course. Webinar #2: How to legally steal your competitors’ keywords. Webinar #3: How to turn great keywords into profitable content. You can enrol Long Tail University independently by paying $197. Get Long Tail Pro $37 per month plus Long Tail University for free. Get Long Tail Pro annual licence for $297, plus Long Tail University for free. OK, which plan you should go for is up to you, but paying $297 annually with free university course is clearly the best value for money. With Long Tail Pro Software, 30-days 100% money back is guaranteed, whereas with Long Tail University if enrolled separately, 60-days money back is guaranteed 100%. Based on my experience, I’d give 8.5/10 to Long Tail Pro. The only reason I think it’s less than perfect is that it’s not web-based but a software that’s installed in my laptop. Keyword search anytime, but not anywhere. Other than that, it acts fast, it enables you to research for multiple words. In my opinion Long Tail Pro is a great essential SEO keyword research tool. Enrol Long Tail University for $197.